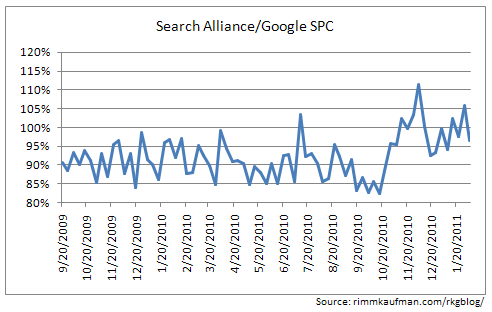 The Rimm-Kaufman Group published some outstanding data (as they normally do) asking What's the Matter with the Search Alliance? In short, they see a down turn in the performance of their paid search campaigns on Bing now that they are migrated with Yahoo. The question they ask is why and what can they do to get back to the numbers from prior to the transition? (2) The reason may be because Bing has been good at "policing" its partner program and dropping out bad partners. (4) Bing is not monetizing its search results pages nearly as well as Google. Thus leading to less ad impressions and ad clicks. 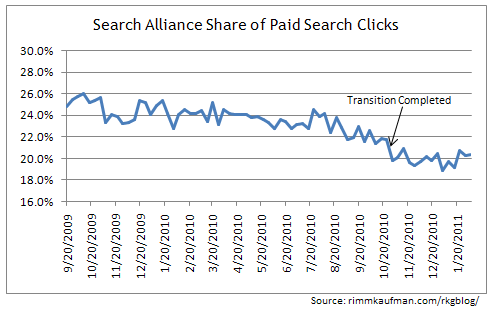 (5) "It does appear that the Alliance may be turning a corner in the last few weeks when it comes to PPC spend and traffic, but it's a little early to call." Anyway, I love the data from this blog and if you do paid search, worth subscribing to.